Voters will have two chances to hear and ask questions of Kitsap County prosecutor candidates, as well as one forum giving them an opportunity to hear from candidates for the Kitsap County District Court judge in Department 1. Islanders for Collaborative Policing (ICP) and the National Alliance on Mental Illness and Kitsap County (NAMI-Kitsap) will hold a forum from 5 to 6:15 p.m. Thursday, July 17, at the Bainbridge Island Waterfront Community Center, located at 370 Brien Drive. The event will feature candidates for the county prosecutor position and will focus on mental illness and drug dependency. The candidates will also discuss how they think people with mental and behavioral problems are being handled by the local justice system. They will also talk about what they will do – or continue to do – as prosecutor to improve outcomes in these areas. The July 17 forum will be moderated by Jane Cartmell of NAMI-Kitsap and Bainbridge Police Chief Matthew Hamner will give introductory comments. An update on Mental Illness and Drug Dependency (MIDD) tax allocations will also be provided by Lois Hoell, a MIDD Citizen Advisory Committee member. A forum for prosecutor candidates and candidates for Kitsap County District Court judge Department 1 will be held from 6:30 to 8:30 p.m. Tuesday, July 29, at Bainbridge Island City Hall, which is located at 280 Madison Ave. N. The candidates will discuss a wide range of law and justice issues at the forum. The event will be moderated by Court of Appeals Judge Robin Hunt. Former Bainbridge city councilman Bob Scales (Democrat), Tina Robinson (Republican, Port Orchard) and Bruce Danielson (independent, Port Orchard) are running against incumbent Russ Hauge of Silverdale in the Kitsap County prosecutor race. The position carries a four-year term. Claire Bradley of Silverdale and Tracy Flood of Port Orchard are running for four-year terms in the non-partisan Kitsap County District Court judge Department 1 office. The primary election is Aug. 5 and the general election is Nov. 4. The Kitsap County Auditor released the official results from the Nov. 8 election today. None of the Bainbridge races were close, so there are no surprises here. For results from all Kitsap races, head over here. Not everybody hates campaign yard signs. In fact, there’s a guy on the Bainbridge who can’t get enough of them. After my recent story about the proliferation of campaign yard signs, retired sign-maker Joe Litus asked that I get the word out to local politicians (and their supporters) that he’d love get his hands on their leftover signs. “I have projects that range from building raised garden plots, to covering a wood shed against the rain, to using them as walls for my grandson’s tree house, and using them for siding on a ‘cat house’ for the grandkids’ cats!” Joe wrote in an email. The old signs are good for insulating basement walls, advertising garage sales, protecting old knees as portable padding and crafting home address numerals. Joe can even shape them into kites, glider planes and the foundations of entire worlds (model train worlds, that is). And with Christmas right around the corner, why not let Joe transform all those sour memories of failed campaigns into holiday cheer? “Ingenuity can be lent to see them recycled into Christmas ornaments!” Joe wrote. The newfangled corrugated plastic signs are best but the vintage-style rigid paper ones are plenty good for reuse. Throw in the wooden stakes. Joe will know what to do with them. Joe’s house is conveniently located near downtown Winslow. Shoot him an email, jmlclassic at yahoo.com, to coordinate sign drop-offs. Here’s the Kitsap Sun editorial board’s discussion with South Ward City Council candidates Sarah Blossom and Robert Dashiell. For more information about the eight council candidates, head over to our most recent story on the races. Also, check out the Sun’s election guide here. Thursday is the last day to file to run for the proposed Port of Bainbridge Island. The November ballot will let Bainbridge voters decide whether to create the new taxing district. At the same time, voters will chose the port district’s first batch of commissioners. If the port measure fails, the commission candidates will have to seek work/public service elsewhere. There are five commissioner spots. Candidates won’t campaign directly against each other. The top five vote-getters in the race will serve on the commission if the port measure passes. County elections officials decided on a very short filing period. It began on Tuesday and ends on Thursday at 5 p.m. So if you want to run (there is no filing fee, by the way), toss your hat in the ring here. Port backers say they’re scrambling to find people to run. When I wrote about this issue last week, only four names were being floated as possible candidates. Most were associated with the city harbor commission and/or island yacht clubs. The port district may have a broad reach, touching on marine environmental issues, the liveaboard community, pubic road ends, tourism, public docks and boat haul-out facilities. Some nearby port districts even run their own ferries (Kingston), air ports and industrial parks (Bremerton) and marinas (Poulsbo). The money at the Bainbridge port’s disposal is expected to start at an annual $600,000. Commissioners are paid on the order of $90 per meeting they attend. Here’s a link to the port backers’ website. Click the above video to hear the City Council At-Large candidates’ discussion with the Kitsap Sun editorial board. Topics included the city’s financial challenges, transferring the Winslow water utility to KPUD, how best to manage staff, among other issues. See the video of the board’s meeting with the Central Ward council candidates here. The Sun’s endorsements for both races will be in Sunday’s paper. The deadline for mailing or dropping off ballots for the primary election is Aug. 16. The four candidates for the City Council’s Central Ward position stopped by the Kitsap Sun office for a discussion with the editorial board. The video of the discussion is above. John Green, Chris Van Dyk, Joe Levan and David Ward hope to replace Councilman Bill Knobloch, who is not seeking re-election. The Sun’s endorsements for the Central Ward and At-Large council races will be in Sunday’s paper. I just got an email from Jay Inslee’s campaign office announcing that the Bainbridge congressman will officially kickoff his run for governor next week. He’ll make the announcement Monday morning in Seattle. Followup stops are planned for Yakima, Tacoma, Vancouver and Spokane. 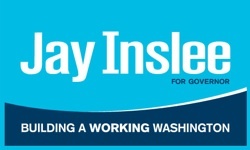 Inslee’s campaign website, www.jayinslee.com, went up this evening. Not much there yet. There’s a photo, a campaign sign (see over to the left), an official campaign slogan (“Building a Working Washington”) and a link for making financial contributions. He’ll be matched against Republican Attorney General Rob McKenna. Inslee was elected to represent the 1st Congressional District in 1998, shortly after moving to Bainbridge. BAINBRIDGE ISLAND — City Councilwoman Kim Brackett will not seek a second term on the Bainbridge City Council. Brackett cited “family obligations” as her reason for not seeking re-election. “Family always comes first,” she said on Thursday. Brackett has a husband and a college-age daughter. No candidates have yet stepped forward to fill her South Ward seat. Brackett has been a dissenting voice against large-scale city projects, including Winslow Way reconstruction and the Winslow sewer plant upgrade. One of her most recent accomplishments was helping the Bainbridge senior center move forward with a long sought-after remodel. She often paired with Councilman Bill Knobloch, who also decided not to seek another term, in calling for greater financial restraint. “I’m proud of everything the council accomplished in stabilizing (the budget),” Brackett said. Longtime Bainbridge City Councilman Bill Knobloch announced on Thursday he will not seek a fourth term. Knobloch said in a statement that his decision was based on a desire to spend more time with family. “My reasons have everything to do with needing more time with my wife and family, including five children and fifteen grandchildren who have been very patient as I served our island for the last ten years,” he said. Knobloch has represented the Central Ward, which includes Winslow, since 2002. He is the longest serving of the current seven-member council. No one has announced a bid for his council seat.